With 650 people attending, last night’s Future of Maryland Manufacturing Gala was an outstanding success. Watch the RMI Gala videos. We will wait until next week to send out full details but I wanted to thank all the young students who made our event great and to everyone who attended. It was extraordinary evening, from the students at Catonsville High singing the national anthem to the exhibits, demonstrations and talks by these future leaders, representing programs from across the state. Drew Greenblatt was honored and we announced he is now the Board Chairman Emeritus. Aris Melissaratos, Dean, Brown School of Business at Stevenson University was nominated and unanimously voted in as RMI’s New Board Chairman. All the Featured speakers, Calvin Butler, Demian Costa and Anirban Basu sent strong messages that the Future of Maryland Manufacturing should be a priority for economic development. Secretary of Maryland Department of Commerce Mike Gill presented a strong case for advancing manufacturing in Maryland and indicated to the crowd that would be working closely with RMI on legislation to help manufacturing across the state. Finally, RMI presented John Raut of GM, who is a long time RMI Board member, with our Outstanding Service to Maryland Manufacturing Award. 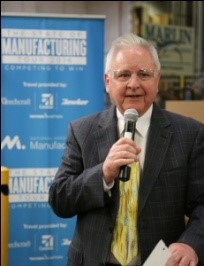 The evening clearly represented a new and stronger voice for the Future of Maryland Manufacturing.